Will Fancy New Vented Beer Cans Bring About the Apocalypse? I’ve seen plenty of posts on Facebook about Louisville being a test market for Bud Light’s new vented beer can. Whooo, fan-cee. Have you seen this thing? Check out the official press release, if you’re so bored you can actually hear your brain cells dying. 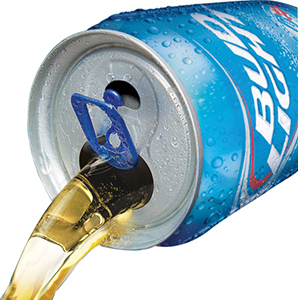 Well, apparently, “The Anheuser-Busch Global and North American Innovation Groups have been developing the Bud Light Vented Can for more than two years to ensure the self-contained vent mechanism created a better can drinking experience that was also easy to use.” Really? Two years? Is it that much of a leap from when Miller Lite tried the same ridiculously stupid idea just two years ago? Nope. This is just Budweiser one-upping the competition by creating amazing new technology that eliminates the need to actually use a sharp object to vent the can. The press release even states this fact – that’s really all this is about. Wow. Two years of exhaustive research, massive trial and error, and top-dollar engineering, all so we can get fizzy yellow beer into our anxious mouths even faster. Maybe they were just worried the idiots actually doing this were in danger of putting their eyes out. Or, you can just do what college kids have been doing for decades: jamming a screwdriver into the bottom, putting your mouth over the hole, and then popping the top. Talk about optimizing your beer flow. Nobody needed to explain the physics behind that to us when we were 18. So why do we need some Bud Light corporate press release to explain this to us now? Also, I love the ridiculous brand-laden quotes in these corporate press releases. Check this one out: “The great thing about our new Vented Can is that it’s activated by a common skill among beer drinkers: opening a can of Bud Light,” said Rob McCarthy, vice president of Bud Light. “With just an extra push on the tab, beer drinkers can unlock the smoothest drinking experience in the world.” Wow. Mind blown, Rob McCarthy. Thanks. But wait … what’s this? 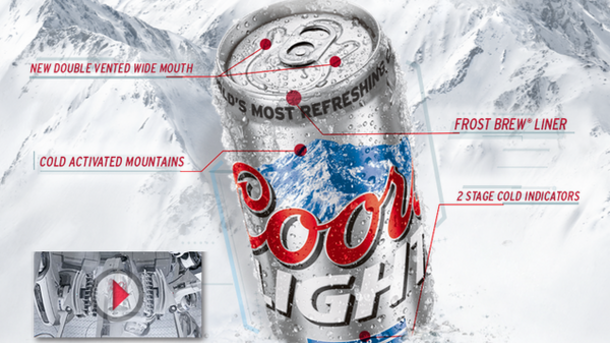 Coors Light has already introduced the DOUBLE-VENTED CAN? How can this be? And take THIS, Bud Light: Coors Light claims this thing is actually “the world’s most refreshing can.” It’s like being “World’s Greatest Dad:” There is no further competition at this point; all other cans, like all other dads, have been defeated. Surely, it must have been Cyberdyne Systems who came up with this incredible double-venting technology (see detailed schematic above), culled from research done on a robotic beer can left behind by a killer cyborg from the future. When this can achieves self-awareness, the Apocalypse will surely be upon us. Eh, whatever. I think I’ll go back for another New Albanian Houndmouth wheat ale, or maybe an Apocalypse Brew Works Fallout Dust. Those come in a glass.